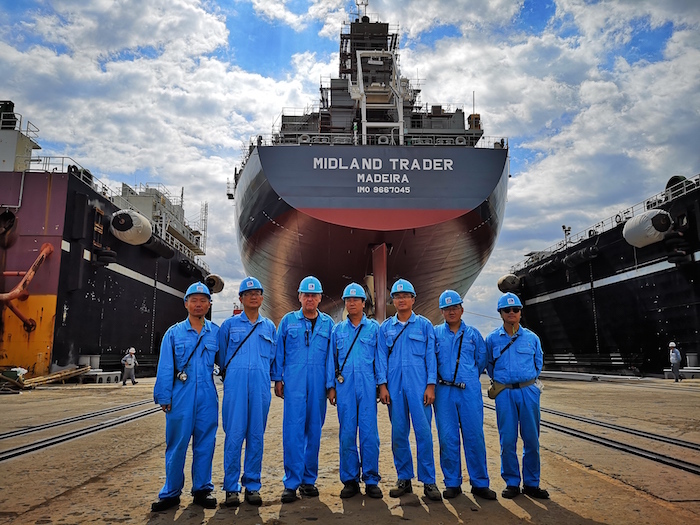 Odendorff's tale of two "Handies"
The picture shows our site supervision team in front of the bulk carrier newbuilding MV “Christiane Oldendorff” (charter name “Midland Trader”) of 36,000 tdw just before launching at Samjin Shipbuilding Industries Co Ltd at Weihai, Shandong. She will be delivered around the turn of the year, while a sister ship, MV “Christopher Oldendorff” (charter name “Hansa Baltic”) is expected to start trading in April 2019. These two eco Handies have an interesting story: We originally ordered them in June 2012 at the then Korean controlled yard. In 2015, the Korean mother company got into trouble. After heavy delays, we exercised our contractual rights to cancel the contracts in 2015 and received back our down-payments with 6% interest. The yard was later rescued by the diversified Shanghai Zhouji Group, which employs 42,000 people worldwide. In July 2017, we bought the ships once again from the new entity as resales. At that point in time, we already had good experience with the yard, when we bought MV “Frederike Oldendorff” (58,000 tdw Supramax) as a resale for delivery in January 2017. The ship is performing very well in our trades. The two 36,000 tonners are of the Korean “FESDEC” eco design and are equipped with 4 x 35 tons “Masada” cranes (Mitsubishi license), as well as a Wärtsilä 5RT-flex 50-D main engine, A-60 bulkhead, Co2 in holds, a 25 t/m2 tanktop strength, “Erma First” BWTS and an energy-saving “Mewis” duct. Both ships have secured long term employment with a major international trading house.